Live Slide Sharing – share slides with participants in real-time on their device. Live Polls/Quizzes – instant or pre-defined polls & show results în real-time. Live Open Question – allow participants to type in answers to open questions. Interactive Images – upload images & allow participants to drag dots. Embed Videos – add YouTube/Vimeo videos in your presentation. Audience Q&A Wall – crowdsource questions during your session ordered by votes. Private Notes – participants can take private, contextual notes. Feedback – gather automatic feedback at the end of your session. Phonetic Codes – share your session using easy-to-pronounce codes. Claps – participants can send claps for the duration of your session. Anonymity – allow unregistered participants to join. What problems does Hypersay solve? Conference speakers & organisers use Hypersay to keep the audiences engaged and to track their level of satisfaction. Follow-up features proves to be of massive help. Companies use Hypersay to engage their existing & potential customers. Marketing & Sales teams can now centralise information on the effectiveness of their presentations and change them accordingly. Hypersay free platform for interactive presentations based on PowerPoint files and Google Slides, with the audience involved. Hypersay is a product by Learn Forward, EdTech startup based in London. It was founded by Paul Balogh and Cristian Dinu. 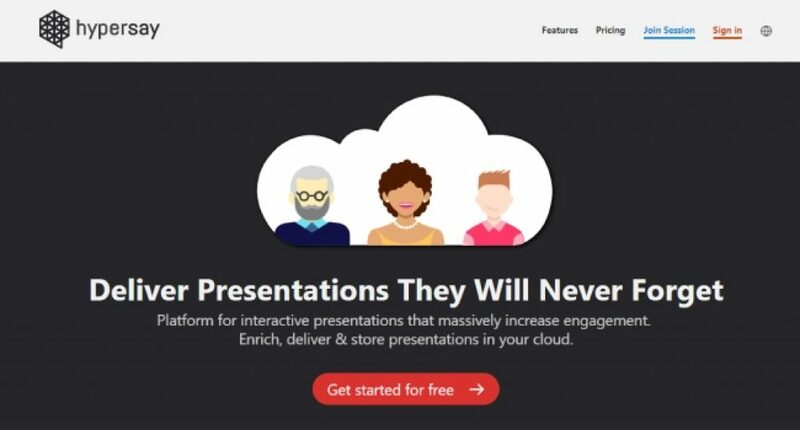 Say goodbye to traditional PowerPoint presentations and make them truly interactive. Hypersay takes regular PowerPoint files and turns them into live sessions, connects the presenter and presentation with the audience through their own smartphones, tablets or laptops with no app to download – just a simple web URL. Designing lessons is part of a teacher’s best work. Why not having your own content digitised and used instead of buying expensive paper textbooks?